Most Kemetics know about execration, or at least, we know of them. Execrations are highly misunderstood within the Kemetic community, and in some ways, they are generally feared. I wanted to clear up some ideas about execrations, and how you can bring them into your practice- whether you’re Kemetic or not. From the moment of its creation, the world was threatened by the Forces of the uncreated, forces that the mere existence of a world drove back toward its periphery. There was no escaping these forces, even if they were pushed further and further back as the domain of the Created expanded. Because they had not been brought into being by the act of creation, they could not be definitively destroyed. They could only be defeated periodically; their repeated onslaughts made it necessary to wage unending battle to maintain the integrity and equilibrium of creation. (quote taken from Eternal Egypt). Creation was not something to take for granted. And it’s still not. In our modern world we forget that things aren’t certain or guaranteed. The gods still fight a/pep daily. They still work to maintain order even though the majority of humanity has fallen deaf to the need or the call. Just because our lives feel more secure doesn’t mean that Creation is any more secure than it was before. The Egyptians fully appreciated the precarious nature of Creation. The wrong flood levels, a bad cycle of crops, invaders, plague- any of that could deal massive damage to the nation and its people. Creation needed everyone’s help to survive- and this is where execrations came into play. Execrations almost seem non-existent in the modern Kemetic’s practice. Most Kemetics have a mindset that execrations are bad- that performing an execration will cause negativity to come back upon you (reminiscent of the Threefold Rule that really has no place in Kemetic mindset or practice). This is a crying shame, in my opinion. Execrations have so many uses and potential for creating happier, healthier people. I really think that everyone should consider making some form of execration a part of their regular practice. Most people consider execrations to be nothing more than a ritual against a/pep, but they can be used for so much more than that. Execrations are good for letting go, for moving on, for destroying bad habits, or for getting negative things out of your life. Anything and everything that could eat away at the happiness in your life could be counter acted with an execration. Don’t like that you’re broke? Execrate anything and everything that is in your way (you could use a ‘foes of Ra’ approach to this). Don’t like that you’re overweight? Execrate your bad eating habits, laziness, or other factors that could be holding you back. Heavy shadow work that you’re trying to work through? Blast that stuff away with a strong execration. Anything and everything can really be enhanced via execration. Execrations are there to demolish things that are blocking your path. So how do you do an execration? Traditional execrations can be pretty extravagant. 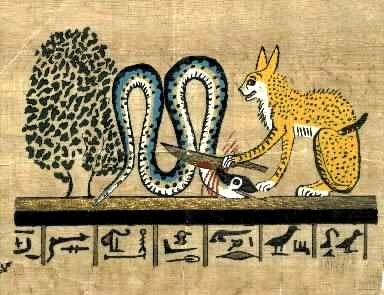 The more complex execration rituals in Eternal Egypt include an ‘ingredients list’ of: water, natron, incense, candle or oil-lamp, a wax figure of a/pep, sheets of papyrus, green ink, copper pan, wood or charcoal, herbs (dragon’s blood, nettle, etc), iron knife or nail, black thread, flint blade, red clay pot, sand and a lid for said pot. Creation and identification of an item with a/pep and the things you wish to execrate (in this post, the item would have been the red pot). Defiling this item via stabbing, spitting, trampling, or other destructive means. Burying, flushing, or disposing of said item. The steps are pretty simple and straight forward. I have found that a lot of what makes an execration effective is the emotion you put behind it. There is some sort of release in ripping apart a piece of paper, stabbing a figure, smashing a pot, etc. It allows your emotions to be let out in a safe manner that helps you to move forward and eradicates things that hold you back. While using an ‘old school’ execration rite from antiquity is awesome, sometimes we don’t have the ability or desire to use something from ‘back in the day’. But no worries, you can easier come up with your own rites and methods to execrate the unwanted or unneeded. To create your own execration, you’ll first need to determine what you wish to execrate. You could try to execrate anything and everything in one go, but I recommend taking a few things at a time and doing multiple, smaller execrations. Once you have decided what you might wish to get rid of, you’ll want to determine what item will best work for your means. You could go the traditional method and use red pots or wax figures. You could use fresh paper. You could build a sand castle or use a mug that you can’t stand. You could create a pillow and stuff it with things that you want to destroy- let your creativity and specific situation guide you. You will then need to imbue that item with whatever you’re trying to get rid of. You can write these items or attributes on the item (in the case of paper or pots), you can state or visualize what you’re wanting to execrate as you create the item (as with the sand castle). You could do both, technically (I tend to). Once you have your item ready, you will take this item and beat the crap out of it. Yell at it, stab it (or draw knifes in it), scribble on it, maim it, stomp on it, spit on it- whatever. Destroy it as much as you can. Put all of your energy into it until you are completely spent. Then, you will take what is left of your item, and get rid of the remains. A lot of times I flush things down the toilet. However, you can’t do that with, say, pot shards. In those cases, I throw them in a dumpster or bury what is left. If you went the sand castle route that I mentioned before, you might want to smooth out the sand to the point that you can’t tell anything transpired. You more or less want to remove and eradicate any and all remains of the execration. How often you want to repeat this process (and how complicated you want the process to be) is entirely up to you. Most Kemetics I know only perform one execration per year- at Wep Ronpet. However, in the month and a bit since Wep Ronpet occurred, I have found that I have done 3 or 4 execration rites of some capacity- and I have found that doing them has helped me progress a lot faster in my shadow work lately. Whether you need to perform them daily, monthly, yearly- etc. is going to be dependent upon your particular situation and what you are working on currently. Don’t be afraid to do them regularly, though. Especially if you feel the urge! I believe execrations deserve to have a more prominent place in modern practice. They have such a variety of uses and purposes, and I would love to see more people give them a shot! Do you perform execrations? What are your thoughts and experiences with them? Well, this post right here has inspired me to get cracking on some execrations! If you do any, you’ll have to let me know how they turn out! I usually do execration by burning parchment on which I have written what it is that I want to part ways with. It’s simple and quite effective. I usually write in red ink (red ochre or red gulal powder based inks) on said parchment (which can be anything from a piece of unused paper to papyrus). I burn the parchment then either give the ashes to the winds, the ground or… flush them down the toilet. At times I even tear the parchment before burning it, especially when it has to do with people I want nothing to do with any more. I feel it gives a bit more personal involvement to the rite. It’s not very messy either, especially if you burn the parchment in a vessel or even in a bonfire! It’s funny this came up because I’ve been thinking of doing an execration in the next few days. Been getting Signs it’s time to do one, so that’s what I’ll do. Will probably end up using paper and burning it, rather than red pots, because I get shouty at red pots, and I’m not inclined to disturb the neighbours with shouty magics. This is brilliant, I am in need of this myself, thank you for sharing this. I just did an execration using the red pot theory. I’d done another one before with a poppet, not knowing what it was called that time. This time, I wrote what I wanted execrated onto the pot in black sharpie, then visualized the red paint as the blood of my ‘enemies’ covering them, washing them out. I stomped, beat it with a hammer, snarled at it, then tossed the lot into a dumpster. On the way back, I noticed the red paint still on my hands. It looks kind of like I had fought a battle and walked away the victor. It’s very satisfying. Reblogging to remember to destroy things on a more regular basis.